A recent Mind Shift article has been getting some attention online and with good reason. Holly Korbey interviewed Vicki Cobb from Interesting Nonfiction for Kids (I.N.K.) about how to get children interested in reading nonfiction. Cobb also recommends nonfiction books for kids to read over the summer. In case you missed it, Louise recommended fiction books for children in a Mind Shift article in June. Speaking of I.N.K., teachers should bookmark this post on the Interesting Nonfiction for Kids site. Elizabeth Rusch has compiled a list of online teachers' guides for dozens of nonfiction books. The links are organized by subject (history, math, science, etc...). I.N.K. hopes to encourage more teachers to bring nonfiction texts in the classroom. Have you ever wondered how an author brings a new project to fruition? 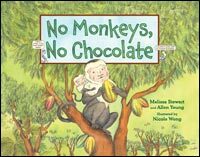 Melissa Stewart has created an interactive timeline that documents the ten years it took to publish her latest nonfiction book, No Monkeys, No Chocolate. Be sure to share this with children in your library or school. Kids are usually quite curious about the process of publishing books. Here's something to look forward to in 2014. Steve Sheinkin's new nonfiction book is scheduled to be released in January. Steve was on hand at a Macmillan breakfast during the American Library Association Annual Conference, and he talked about The Port Chicago 50: Disaster, Mutiny and the Fight for Civil Rights. The book is set at the Port Chicago naval base in California during World War II. Sheinkin documents how a group of African American workers were charged with mutiny when they refused to return to work due to unsafe working conditions. Sheinkin, who is known for doing meticulous research for his books, references dozens of books, articles, Navy documents and oral interviews conducted by Dr. Robert Allen of Berkeley. You can read more about Sheinkin's project in this blog post on the Teaching Books site. Steve Sheinkin talks about his latest book at a Macmillan event in Chicago.